Should make it a 1 stopper.....medium towards the end. Merc was much much faster than anyone on hard (medium tires) on Barza tests and on Bahrain. yep, Mercedes got tyre strategy and tactics right. Ferrari got them wrong, BUT Sebastian (being the that he is) was sublime with his car control on tyres that were completely shot with 10 laps to go! Sometimes it pays to be good. Sometimes it pays to be lucky. And sometimes it pays to be both good and lucky! Ferrari dodged one bullet at Bahrain. It was a nail biter till the end. I like the medium tyre.....messes with everyones tyre strat. Seb's tire control and car management was sublime indeed. However, if this was 2010-2016 with the narrow chassis cars, i think he would've been easily overtaken. as long as it isn't a red car! yep, Mercedes got tyre strategy and tactics right. Ferrari got them wrong, BUT Sebastian (being the bada$$ that he is) was sublime with his car control on tyres that were completely shot with 10 laps to go! I disagree that Ferrari got their strategy "wrong". 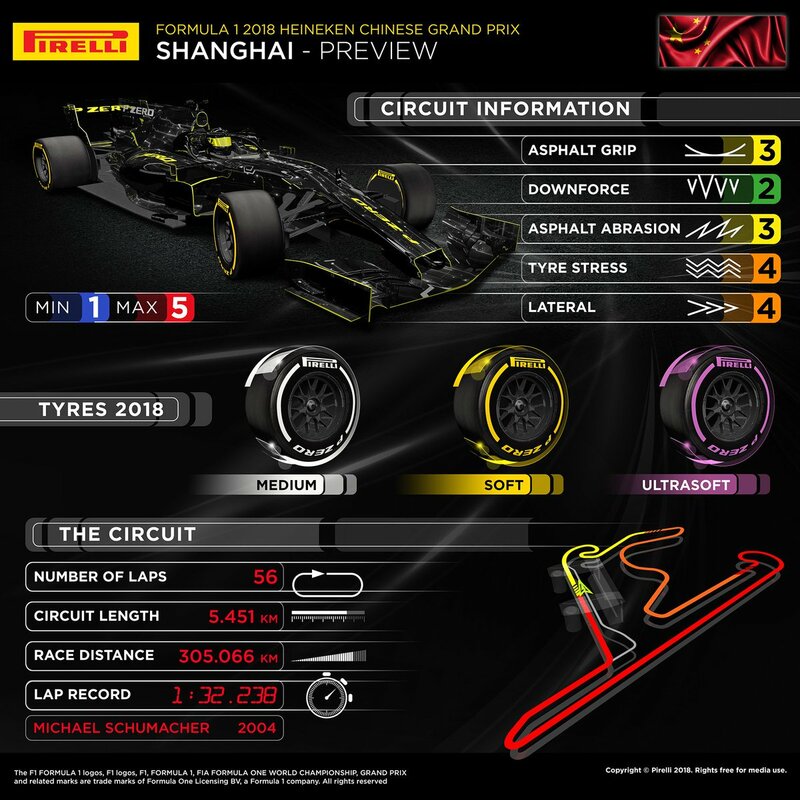 Will the medium tyre work in cooler temperatures in shanghai ? I certainly would not want a repeat of last year where Ferrari, both Kimi and Vettel, "blew" their tyres on the last lap all due to tyre strategy. Remember that??? This was too close and Seb said the tyres were gone 10 laps ago. We should not do that again. Did you see Ferrari on medium tyres in Bahrain? No we still dont have a clue if Ferrari could matched the Mercedes pace on mediums, I think we could. With US the QUALY tyre in China with a good setup my opinion is that we can get also pole position. Its good that people are finally bringing to light the mad max immature driving. Now that it happen with hamilton it seems people are talking.no red car is safe with him around, hopefully at china ferrari can get front row and leave mercs with max close by. Maxcrashen the first he is gifted but dangerous to be around you need to be on full alert with this guy a type of mr magoo just drives and leaves the carnage behind. We had to do what we did to win the race. Ferrari clearly wanted a 2-stop w/ both cars. The first thing that compromised that strategy was Kimi failing to be second after the start (or first w/ Seb second). I don't see the bad strategy and think the team should be commended for having a good strategy that could be adjusted on the fly based on what happened in the race. That is what Ferrari did, and it lead to victory. these are Sebs times from lap 40 onwards....he is losing time every lap. I agree it was a win based on luck and very awesome driving but going forward, this is not how you want to win a race with Mercedes. I'm sure Ferrari has this and will learn from it given the tyre and track conditions. If Max winds up on a "pole winning team", he may never lose a race! A top car + Max's desire to win. Ferrari needs him. So was the drop off in the race due to the tyres wearing out faster than Ferrari expected or could it be that they have improved their version of party mode for quali? According to Pirelli, the tyres Seb had on were only good for 30 laps....Seb went 39 laps on said tyres....so the tyres were wearing out lap after lap. Seb said the tyres were gone 10 laps ago after finishing the race...which makes sense given Pirelli's criteria. I will note that Seb kept quiet about this during those last 10 laps knowing all the while Mercedes was listening......smart on his part including the drive which is why he gets paid the big bucks. Simple ferrari have built and designed a car which is fast reliable and kind to its tyres hard to beat. The way I see it, Ferrari were just managing their lead in the first half. Second half they needed to respond to Mercedes Plan B, so naturally when Ferrari went to plan D, Vettel had to manage his pace again on degrading tires. I think Mercedes had a brilliant change of strategy, and so we never saw the 2 teams on equal terms. Anyway, in China, Ferrari will have the new parts. I'm hoping we'll see more improvement and a strong race. I saw Hamilton a bit worried. No matter what kind car or team you have if you crash q1. Its a shame that the whole friday might be rainy, saturday,sunday looks dry. So the only time to test our updates will be for FP3. Hope forecast will change to better and less rainy. Can you give me the link about 6 tenths? I looked everywhere and still couldnt find it. Thank you. Last edited by Vettel165; 10th April 2018 at 10:21.
looking forward to China. One aspect that was really encouraging in Bahrain was our front row lockout in qualy. Compare that to last year i think we qualified p3 and p5. No thank you I hope Verstappen will never join our team, Ricciardo would be a better choice. Last edited by Vettel165; 10th April 2018 at 07:32. Can you give us the link because i can't find an article saying that ! !